Crown Publishing Group (NY), 9780804139540, 400pp. Since 9/11, more than three hundred Americans--born and raised in Minnesota, Alabama, New Jersey, and elsewhere--have been indicted or convicted of terrorism charges. Some have taken the fight abroad: an American was among those who planned the attacks in Mumbai, and more than eighty U.S. citizens have been charged with ISIS-related crimes. Others have acted on American soil, as with the attacks at Fort Hood, the Boston Marathon, and in San Bernardino. What motivates them, how are they trained, and what do we sacrifice in our efforts to track them? Paced like a detective story, United States of Jihad tells the entwined stories of the key actors on the American front. Among the perpetrators are Anwar al-Awlaki, the New Mexico-born radical cleric who became the first American citizen killed by a CIA drone and who mentored the Charlie Hebdo shooters; Samir Khan, whose Inspire webzine has rallied terrorists around the world, including the Tsarnaev brothers; and Omar Hammami, an Alabama native and hip hop fan who became a fixture in al Shabaab's propaganda videos until fatally displeasing his superiors. 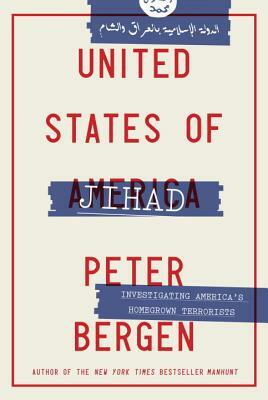 Drawing on his extensive network of intelligence contacts, from the National Counterterrorism Center and the FBI to the NYPD, Peter Bergen also offers an inside look at the controversial tactics of the agencies tracking potential terrorists--from infiltrating mosques to massive surveillance; at the bias experienced by innocent observant Muslims at the hands of law enforcement; at the critics and defenders of U.S. policies on terrorism; and at how social media has revolutionized terrorism. -- Washington Post, Notable Non-Fiction Books in 2016. Peter Bergen is the author of four previous books about terrorism, three of which were New York Times bestsellers. He is CNN's national security analyst, vice president at New America, and a professor at Arizona State University. Bergen has held teaching positions at Harvard and at Johns Hopkins University and is a graduate of Oxford. He lives in Washington, D.C., with his wife, documentary producer Tresha Mabile, and their two children. Find him at PeterBergen.com.